An O-Ring is a round donut shaped ring usually made from various types of rubber. In general, an o-ring is used in assemblies to seal fluids or gases in a wide range of temperatures and pressures. 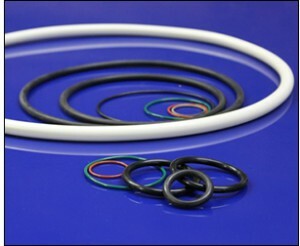 O-rings can be found in both static and dynamic applications, as well as drive belt applications. The Rubber Consortium produces the highest quality O-Rings in many varieties of these materials: Nitrile, EPDM, Neoprene, Silicone and Fluoroelastomer as well as many other custom compounds. O-Rings are commonly identified by the Inside Diameter (I.D.) and Cross Section (C/S) and are available in all standard AS568- sizes (see our O-Ring Size Chart) and European and Japanese Metric sizes. Contact us today for a quotation at info@therubberconsortium.com or submit a request for a quote online here.